Music, Schnitzel and presentations. All those great things and way more Vienna has to offer! But why presentations? You have a few days left to apply to to get to one of the biggest and best judge conferences this year, the level 2+ Conference, this year in the Austrian capital Vienna! Application deadline is the 31th of March, that’s only a few days away so hurry up! The conference has up to 3 tracks in our great venue. During the conference we will offer free soft drinks at our own venue bar and we will also organize a “bring your delicatessens from home” afternoon snack season, were you can bring a bit from home and enjoy the variety from around Europe in return! For Friday and Saturday we’re going to pick two great dinner locations for you to enjoy the great food and the drinks Vienna has to offer. If you are vegetarian or vegan, do not worry, we will take care of you as well! There will also be guided tours by local judges on Friday and Sunday for you, if you want to get to know Vienna a bit closer. There will also be a recommended list for Escape Rooms and loads and loads of board games for you to try in the evenings! We are also still looking for presenters for the event. If you think you have what it takes to fill those spots, then contact Yuval Tzur directly! The only thing missing for this great weekend is you! 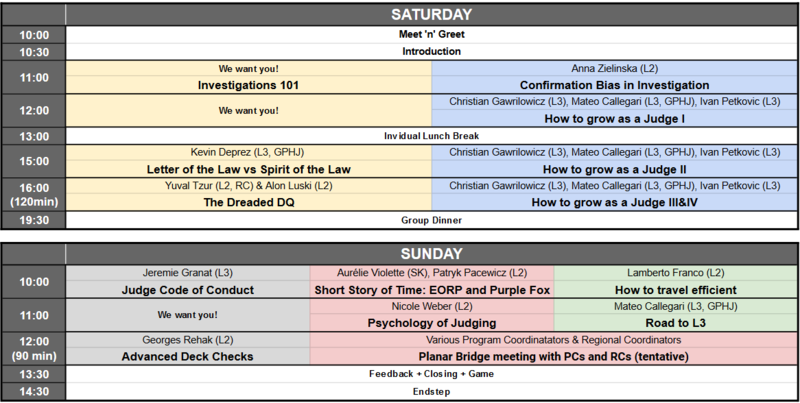 Enjoy a weekend with us and all the other judges with a weekend full of learning, food and fun.